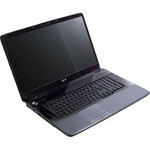 Acer delivers a big 17.3-inch screen and decent performance for an affordable price. In the tradeoff between price and performance, the Acer Aspire 7735Z (4357) strikes a pretty good balance for budget shoppers who want a machine for basic tasks. This notebook’s processing and graphics muscle won’t win over a true multimedia maven’s heart, but users who just want to watch DVDs or Hulu videos will have a satisfying experience. The $348 Toshiba Satellite L355 provides even more bang for your buck, but the $599 7735Z’s more attractive chassis, longer battery life, and more robust feature set (including a memory card reader, HDMI, and webcam) make this budget machine a compelling bargain. As ever fewer desktop PCs find homes with loving families, we take a look at what might well be yet another nail in their coffin: Acer's newest 17.3in multimedia laptop, the Aspire 7735Z-424G32Mn. Acer's Aspire 7735Z is a reasonably attractive, well-built and (aside from the horrible touchpad buttons) well-designed machine. If you want a large-screen desktop replacement for films and productivity it's a bit of a bargain.